“Year after year it is an absolute honor to be included amongst the leaders in this field and to be recognized by REMODELING who is the nation’s premier publication in servicing professional remodelers and home improvement contractors.” Said Treeium, Inc. CEO Moty Ginsburg. 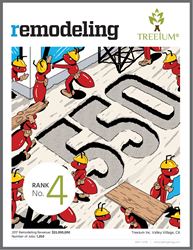 For the third consecutive year Treeium, Inc. has not only found itself on the Remodeing550 list but has been honored to be listed in the top five remodeling organizations. The Remodeling 550 brings together the nation’s 550 biggest full-service remodelers, replacement contractor, home improvement firms, insurance restoration firms, and franchisors. Of the 100,000 remodeling firms throughout the country, it is an amazing achievement to be listed among the top 0.5% in the nation and even more so impressive to consistently be amongst the very top of this prestigious group of organizations and firms. “You can tell from the 2017 reports and 2018 forecasts that today’s biggest remodeling companies are busier—and likely more successful—than ever before” said Craig Webb, REMODELING’s editor-in-chief. Webb goes on to explain that the top 300 full-service firms and 150 biggest replacement contractors on this year’s REMODELING 550 collectively did nearly 635,000 remodeling projects worth roughly about $5.54 billion. All 550 firms can be found online at http://www.remodeling.hw.net. There you can sort and filter the data, which includes information on the company’s location, 2017 revenues, number of projects, and average job size. “Year after year it is an absolute honor to be included amongst the leaders in this field and to be recognized by REMODELING who is the nation’s premier publication in servicing professional remodelers and home improvement contractors.” Said Treeium, Inc. CEO Moty Ginsburg. “Our goal from the very jump was to put our clients first and to assist them in any and every which way possible. To go above and beyond the norm and provide a quality service that is simply unmatched.” As Treeium continues to grow and expand, there will be a continued focus on depth and quality of the services we offer to our clients. It is an absolute honor to be on this prestigious list in 2018, we thank all the hard working men and women that make this organization run as smooth and streamlined as possible. For all your remodeling needs, be sure to visit us at Treeium.com today. 2017 has been great, here’s to 2018!